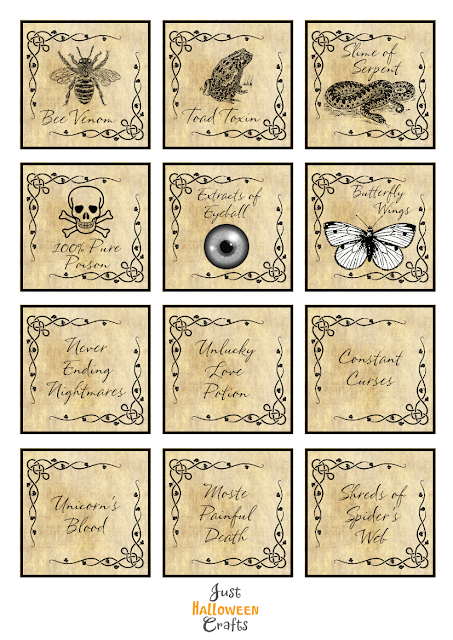 If you want to make up a few DIY potion bottles or even an apothecary cabinet for Halloween, here's a free printable sheet of Halloween potion bottle labels that you can use. These are all square shaped designs and you can choose to cut around the black border which is nice and easy. Alternatively cut the potion bottle labels down further and just snip out the text and the images separately. The black print is over the top of a parchment style antiqued background which helps to age them somewhat. Enjoy the freebie and use it for your seasonal Fall crafts. Here's a selection of some free printable Halloween potion bottle labels for your Fall season decorating. These antique and aged style designs contain all the common potions you can think of to stick onto your bottles. Bee venom, toad toxin, extracts of eyeball ... which horrible ingredients, charms or curses will you be using? Let me know what you end up doing with the free sheet for your own crafting. To use the labels, print them out onto a sheet of paper, card or sticker sheet. Cut around the black edges and then stick them onto jars, bottles and little boxes. I normally use a white liquid glue such as PVA or Elmers school glue. This free potion bottle label printable is for your personal use only. You are welcome to blog about how you've used this freebie along with your own photos providing that you include a link back to this page.